Hidden Figures is the movie everyone should watch. It educates us and entertains us at the same time. It puts the civil rights movement and segregation in a perspective that most of us have only read about in history books. In a world in which being both black and a female were disadvantages, to say the least, Twentieth Century Fox shows audiences that if you have the guts to do it, nothing - including color or gender - can stop you. Based upon Margot Lee Shetterly's non-fiction novel, Hidden Figures: The Story of the African-American Women Who Helped Win the Space Race, Fox's Hidden Figures recounts the tale of the civil rights movement in an unfamiliar setting. Instead of the bus, or a street, or an elementary school, Hidden Figures tells the tale of three brilliant women who used their brains and talents to find a way to climb one of the most exclusive and important "corporate" ladders in America – NASA. 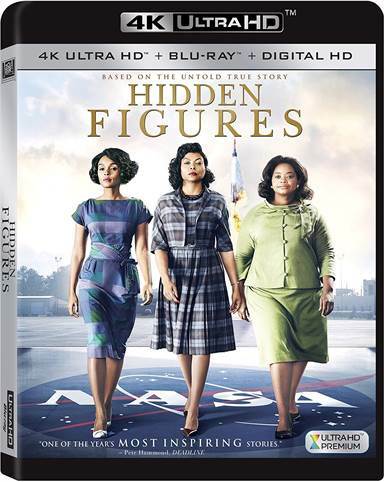 Based on the true story of the African-American mathematics genius, Katherine Johnson, and her two fellow friends and co-workers, Dorothy Vaughan and Mary Jackson, this film brings us the little known before told history of three women who, because of their stamina and determination, may have just made the United States win the race to space. Without their math genius, John Glenn may never have been the first man to orbit the Earth and return safely. Taraji Penda Henson (Baby Boy) gives an outstanding performance as Katherine Johnson, a young black woman, who from a young age solves math problems like no one before her. Henson's performance brings the realization of what it was really like to be a black woman in the 1960s to a modern society that has never experienced the discrimination that this young woman had to go through. Hensen brings an unsuspecting personality to what seems to be a shy young woman trying to keep her true genius hidden from the rest of the world. It's as if she's almost trying to be invisible but at some point, she's finally noticed and appreciated. Octavia Spencer ( A Time to Kill) plays Dorothy Vaughan, the in-charge, in-your-face manager wanna be. Watching her performance shows that it doesn't make a difference what color you are, but your perseverance and your dedication to your job will get you far. Spencer's character is cunning and devious but never malicious. She looks out for the girls that work under her and realizes the potential of what they could do. She looks to the future, she educates, and she proves the intellectual worth of not only herself but the women under her. Spencer reminds me of a mama bear always looking out for the dangers ahead and making sure that her cubs have every opportunity available to them. Spencer's performance is captivating and you'll find yourself rooting for her because she is rooting for everyone else. Janelle Monáe ( Moonlight) is Mary Jackson. Jackson works in engineering but doesn't think much of herself. She's encouraged by her mentor to go to school to obtain her engineering degree to advance at NASA. Monáe's acting leaves you with the impression that she doesn't think she's smart enough to pursue this career path. This definitely contrasts with her strong personality at home and Monáe meshes the different personalities within the one character so beautifully that you can identify with her struggle in the workplace and the control she has at home. Also part of the cast is Kevin Costner (Waterworld) who gives an outstanding performance as Al Harrison. Costner plays a white man in contrast to the women involved in this movie. He sees the value of the intelligence over the color of one's skin. Costner is able to portray this with dismay over the way Johnson is treated by her coworkers and demands equality for the women he sees working so hard. Costner's performance is heartfelt and, after opening his eyes to the situation, he is able to ensure that his character teaches the audience a lesson about humanity and our fellow neighbors. Watching a film in UHD is absolutely breathtaking. Presented with an aspect ratio of 2.39:1 and a 2160p transfer using the HEVC codec, the 4K experience brings sharpness and color perfectly to the all-seeing eye. If you contrast the Blu-ray disc to the UHD format you can clearly see the detail quality on the Blu-ray is less clear as in the UHD. It should be noted, though, that the HD presented in 1080p is still very pleasant viewing experience. The audio is presented in DTS-HD Master Audio 7. Even a home sound system, dialogue is clearly heard through the center channel with the background music coming from either side. Sound effects, especially during the NASA rockets take off's and engineering scenes in which rocket and wind speeds are being tested, are not overpowering because the balance of sound presented. Audio commentary by Director/Writer Theodore Melfi is the only bonus feature found on both the UHD and Blu-ray disc. It All Adds Up: The Making of Hidden Figures - over 40 minutes of a five-part documentary about the film's production. Deleted Scenes- Watch eight scenes of over 10 minutes of footage not included in the original film. Hidden Figures: Filming in Georgia (5:15, HD): Director Melfi, pong with other members of production and cast spend over five minutes discussing filming in Atlanta. Gallery: View twenty-seven color stills from the film. Hidden Figures is the movie everyone should watch. It educates us and entertains us at the same time. It puts the civil rights movement and segregation in a perspective that most of us have only read about in history books. The cast was perfectly chosen and excelled in their performances. They are to be applauded for taking such a sensitive and politically induced topic and letting us touch the reality. Download Hidden Figures from the iTunes Store in Digial HD. For more information about Hidden Figures visit the FlickDirect Movie Database.